My first national television interview was in 2005. It was on “100 Huntley Street,” and we discussed my first book—10-Minute Time Outs for Moms. There’s a three-hour time difference between British Columbia and Ontario. When I woke up in Burlington that morning, the alarm clock said it was 5:30 AM, but my body’s time said it was 2:30 AM. Between fatigue and the fear of failure, I remember thinking, How in the world am I going to string even two sentences together in a coherent manner? The words helped me refocus. 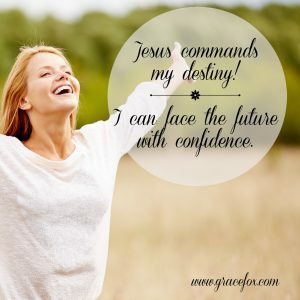 Yes, indeed, Jesus controlled my destiny. My future wasn’t dependent on whether or not I aced that interview. I didn’t need to strive to impress my hosts or the television audience. I just needed to give the best interview I knew how and to trust Jesus to empower me and work out His good purposes through me. That realization lifted a huge weight from my shoulders then, and it continues to encourage me eleven years later. God commands my destiny and nothing can thwart His purposes as I consistently seek to give Him first place in my life. How about you? Are you carrying the weight of trying to secure your future? If so, how’s that working for you? Daniel 5:23 says that God gives us the breath of life and controls our destiny. We ought to find this truth hugely freeing. And we ought to find it highly motivating to ensure that we give Him the honor He’s due because of who He is. He’s trustworthy, faithful, loving, all-wise, all-powerful, holy, and sovereign God. He is God over all gods. He has no equal. This is the God whom we serve. When we are in right relationship with Him, we need not be afraid or behave as though our future depends on our smarts and skills. We can cease striving and rest because He’s got our back. So…how can we honor the God who gives us the breath of life and controls our destiny? By daily expressing thanks to Him for the gift of life and for being aware of and in control of every detail concerning us. He sees the tiniest sparrow fall, and we matter more to Him than the birds of the air. By daily surrendering ourselves to Him for His highest purpose. We might think we have our day and agenda set, but He might have a different idea. Let’s let Him do what He wants knowing His purposes are always higher than ours. By daily inviting Him to fill us. If we try doing life in our own strength, we’re bound to fail. We’ll dishonor God by thinking inappropriate thoughts, saying hurtful words, harboring wrong attitudes. You get the picture. Living a life that honors Him is vital, but it’s possible only through His empowerment. God gives you the breath of life and controls your destiny. May this truth encourage you today, my friend. No matter what you face, God’s bigger, and He’s got your back. P.S. 10-Minute Time Outs is no longer available in stores, but I have copies. It makes a wonderful gift for moms with kids of all ages. Order your copy now to receive in time for Christmas. Jesus is My Shepherd – What Difference Does That Make? So wonderful to hear all this. LIGHT!!!! And So then……God of all Creation…..of Abraham, Isaac and Jacob……He who rules the heavens and the earth, whose Kingdom shall have no end (and we are heirs of this kingdom), Father…….shine forth your LIGHT into the earth even now, Lord, and let your LIGHT and your GLORY cover all the earth, in the Name of Jesus Christ our Lord, Hallalujah, Amen! ….and so be it. Amen, Marge! Speak the truth! Let’s claim what’s rightfully ours as children of God and walk it out. Happy 49th anniversary! This is truly a milestone and a testimony of God’s power at work within the lives of those who trust Him. Amen. and Thank you Grace. Without God, I don’t believe we would have gotten to this. We are ever grateful to our loving Father; to Jesus, and for His Holy Spirit. We are truly blessed. And blessings to you and yours, Marge. Have a very Merry Christmas!